Have a game you want reviewed? Drop me a message with information about the game and I'll do my best. Is it a game you made? I'll gladly play and review it. Just send me a copy. Send the file to my email or contact me for shipping information if its a hard copy. I'll even play your card and board games. 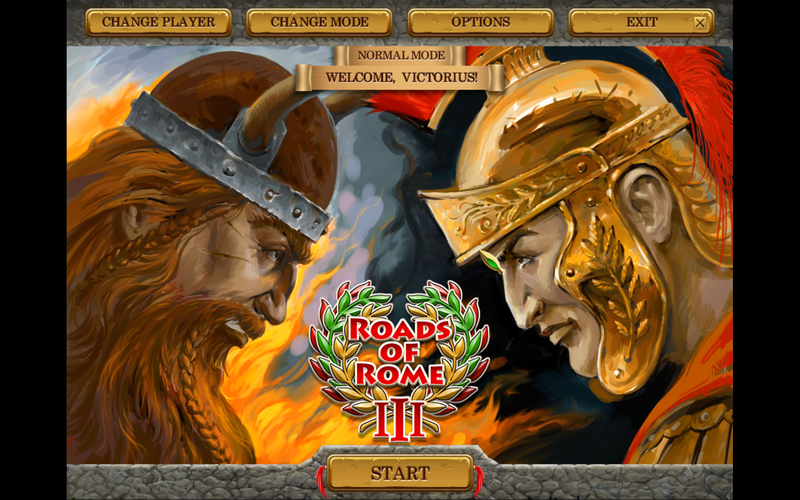 Roads of Rome III is a time management game where you play a general in the Roman army. Your task is to repair the infastructure of Rome so the barbarians hordes descending on the Empire can be defeated. My first thought as I was going through the opening story was that it was a bit more than the game really needed. I mean, context is great and all, but do I really need to know that the general’s wife is pregnant and his motivation for saving Rome is that he’s doing it for his unborn child? What about the glory of Rome? Senatus Populusque Romanus. Other than that, I liked the intro. The art for it was absolutely fantastic. The game itself is controlled entirely with the mouse. There’s no need to scroll around the screen to see resources and objectives, which made me extremely happy since after the first level there are time limits. I tend to find that single player games where you need to move all over the map add needless difficulty unless the level timer really accounts for that. 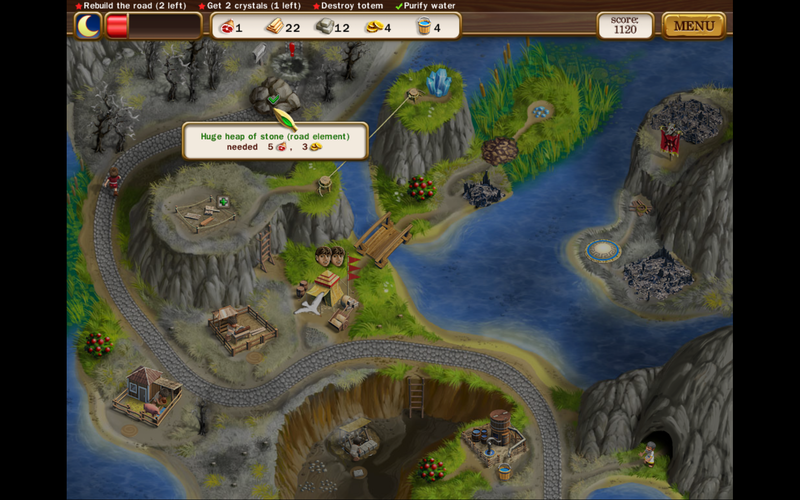 There are 7 different resources involved in the game. What you say? You only see 5 on the bar. Well, the 6th is your workers and the 7th is time. You start each level with a single worker and as the game progresses, it lets you upgrade your base camp more and more to get more workers. An hour in, I had 3 workers going at the same time. Each level has a set of goals that need to be achieved. These always include rebuilding the roads and generally include rebuilding other pieces of the infrastructure around but might involve gathering special resources or purifying a water source. The graphics in the game itself are simple, but well animated. I found them to be kind of adorable. One thing I rather liked is that periodically things in the terrain that might not look interactable but are will shimmer white to draw attention to them, especially if they are currently reachable. I also like the the mouse will have a little green check mark if you have a worker available but there’s a red X instead if you don’t. There are four different modes of play: hard, normal, easy and relaxed. I played through the entire 1 hour trial on normal and I have to say, it felt too easy. I played through a good chunk of levels before I ran out of time, only playing two twice to make sure I got expert times on all of them. If I didn’t manage an expert time the first play through, it was extremely easy to figure out how to optimize my approach for the next play through. Hopefully the difficulty increases after the first hour of play, but that sample leads me to believe that the normal difficulty is a bit too easy. Overall, I enjoyed Roads of Rome III, but there were a few things I feel like could have been improved. With the story so involved in the beginning, I was sad that I didn’t hear any more, though that could have just been because the trial was only an hour long. 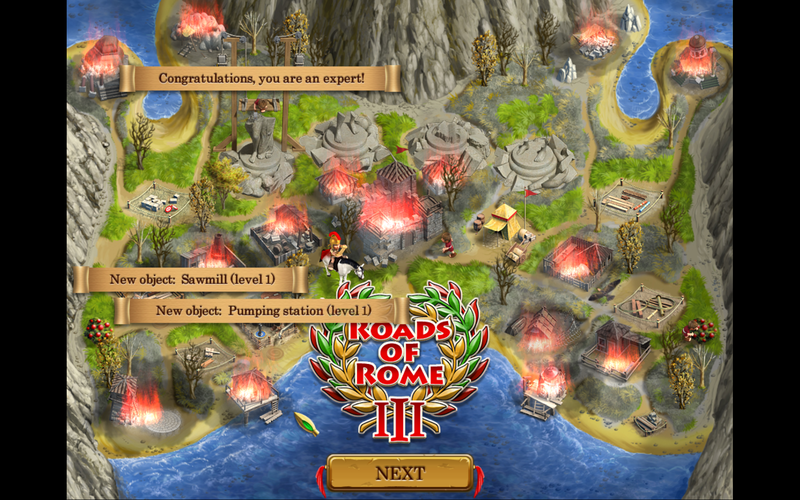 I award Roads of Rome III a 3.5 out of a 5 hearts. If you would like to play Roads of Rome III, you can find it here on Big Fish Games. There is a 1 hour free trial or you can buy the full game for $9.99. Papa’s Wingeria is a time management based strategy game out of Flipline Studios, the makers of the whole Papa Louie line of games. The basic concept of each of these games is roughly the same. You play the only employee at one of Papa’s many restaurants, managing the register, food prep and serving the customers all at once. And these customers are picky about their food. On top of that, you have to save up from your meager tips and once a week pay to get upgrades for the store, like timers or a doorbell. Each day, an increasing amount of customers arrives and the amount of choices they have for their food also increases, while a day always stays the same amount of time. Early in the game, you don’t really have to manage your time but you have to stay on top of the cooking food to not burn it and watch for new customers actively. As more and more customers arrive, time becomes much more important, but hopefully you will have picked up things like the fryer alarms and the doorbell so you can know what’s going on while on other screens. The graphics are simple, though the building phase is very well made and the food goes exactly where you put it. While this is much more evident in the other Papa Louie games, especially Papa’s Burgeria, it still holds true here. And positioning during the build phase is very important for your final score. 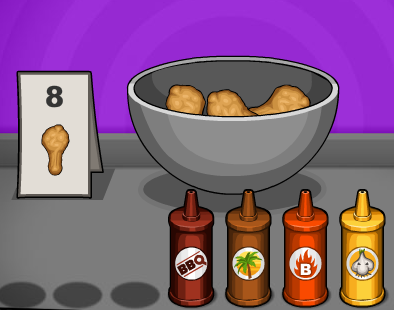 One of the things I really appreciated while playing is that the sauces for the wings are each a very distinct color which makes it possible to sauce the wings without having to manipulate the orders too much and thus waste time. Scoring is based whether or not the order is correct, how well the wings were sauced, how well it was plated and how long the customer had to wait. This does mean that the wait score can be extremely difficult to achieve as you get further in the game and things get more complex. There are also special customers called Closers who arrive at the end of each day and they score more harshly than the other customers. 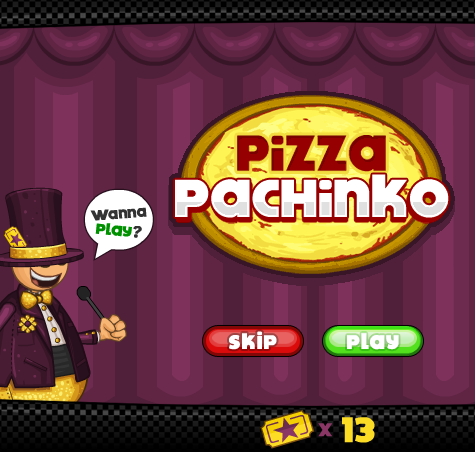 Between each day, there are rounds of optional mini-games based on the other Papa Louie games. These give chances to win extra money, items for the shop or clothing for your avatar. The item rewarded by the mini-game depends on which Papa Louie game it was based on and they don’t seem to reward store upgrades, just decorations. Though decorations can improve your waiting score. You earn the tickets to play the mini-games by doing a good job in the main game. Overall, I very much enjoyed playing Papa’s Wingeria, though I will say that if you don’t enjoy stress, this isn’t the game for you. Time management games are an exercise in frustration. The graphics fit the feel of the game, the difficulty ramps up nicely and the mini-games are a nice touch to change the flow of the game. I also appreciate that there is a pause button during the main game. I award Papa’s Wingeria 4 out of 5 hearts. 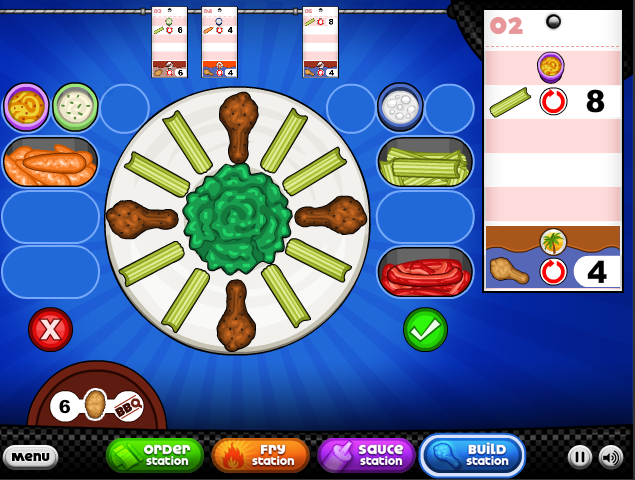 If you’d like to play Papa’s Wingeria, you can find it here on Kongregate. Ever wanted to really simulate the growth and development of a budding super hero or adventurer? I know I have. I particularly enjoy taking a character from humble origins and working their way up. The idea of a character slowly developing abilities is great, but what if you’re not using a level based game system? Well, what if even the player doesn’t know what their character can do? Certainly that requires more effort on the part of the GM, but the players love it. Four kids from mundane backgrounds get tested and discover they have magical powers. This results in them getting sent to Nightshade Academy for training, but first we have to find out what these kids can do. Each player in the one-shot got a character sheet with some blanks and some ???’s. The blanks were for them to make the character their own and the ?? ?’s were their hidden abilities. Players could try to activate their powers, or in certain situations where their powers were likely to manifest, they could make the same roll. Assuming a success on the roll, they would be able to fill in the spot on the sheet with the pre-written power. This led to some great moments like one character getting angry and suddenly turning into a wolf, never having known she was a werewolf. The mechanic was pretty simple. Fudge uses 4 dice with +,- and a blank side. If the player or I wanted to see if the character could make their powers work, they just rolled the dice to see if it worked. Assuming a positive net result, the character would discover their powers which may or may not have been useful in the situation. This game actually later turned into my current diceless game and several of the pre-gens from this encounter became full characters. In my current game, Nightshade Academy: World at War, the players are a group of school kids living in 1940s Britain trying to get their hands on the holy relics of the gods before the Germans can. I offered them a chance before the game started that one person could play a special character, a pre-gen with amnesia. I wrote up a full character sheet. I can’t say too, too much since the full truth of the character hasn’t been revealed yet and the game is on-going. So far they’ve found out that she’s originally from Germany and was wearing a military uniform when they found her. The mechanic for this was even easier. The system is Fudge Diceless so any time she tries to do something, I just tell her how it goes based on her skill and if she’s trained in the skill, I reveal that to her. She also had one of her Gifts hidden from her. This went a bit faster than I would have liked, resulting in the character currently being completely separated from the rest of the party because she realized she’s a danger to her friends. The mechanic of hiding skills works out pretty well, but you have to make sure you have players who are down for it and make sure you don’t create a character that your player isn’t going to want to play. You really have to know your players and still leave room for them to make the character their own. Don’t expect them to play your vision, just give them a skeleton and let them flesh it out. I had a lovely review planned for today for a game called A Tale of Colours that one of my friends pointed me at…then I found a new game from PETA. 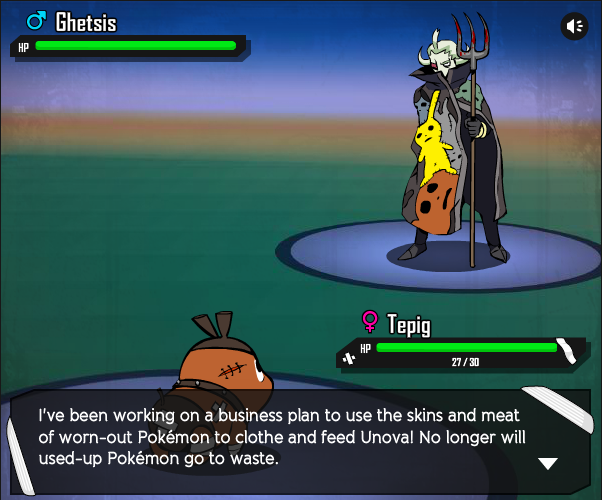 Its a parody of the Pokemon series, set up to be a serious game. I’m going to preface this whole review with the fact that I’m going to do everything in my power to objectively review this game for its merits as a socio-political persuasive game, but I feel I should mention that I love Pokemon, I eat meat and I tend to view PETA as a touch crazy. With that disclaimer noted, lets head into the game. The Pokemon franchise is based around the idea of letting kids capture little creatures and then breed and battle them. It was based off the childhood of the creator, catching bugs and studying them. But enough is enough, says PETA! We cannot allow children to have fun by caging helpless animals and forcing them to fight each other. They created a Pokemon style game where you play as the Pokemon. 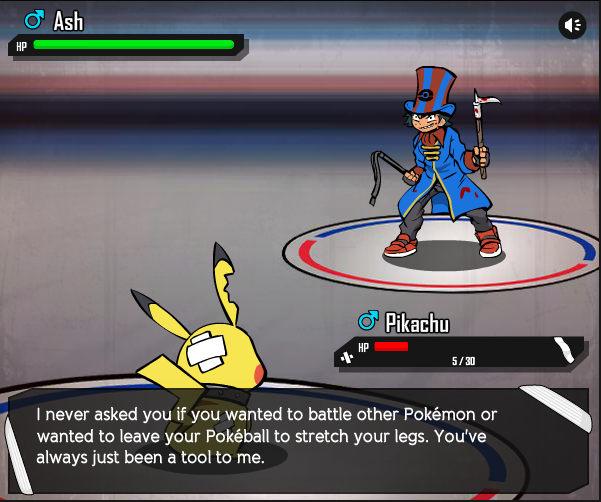 Unlike other games, the Pokemon are fighting their trainers and trying to spread the word about the fact that this violence hurts them and that they have feelings too. As with other PETA games, the game play includes rewards which are videos showing the harm to animals caused by humans. The idea is to indoctrinate the players. The problem is that the games are geared for children and they tend to be far too over the top to actually convince most kids. I tend to find that scare tactics just leave kids having nightmares, not actually changing their attitudes towards anything. The biggest problem with this game as a persuasive game is that any kid who has actually played the Pokemon games knows that the main character wins because they love their Pokemon and bond with them. 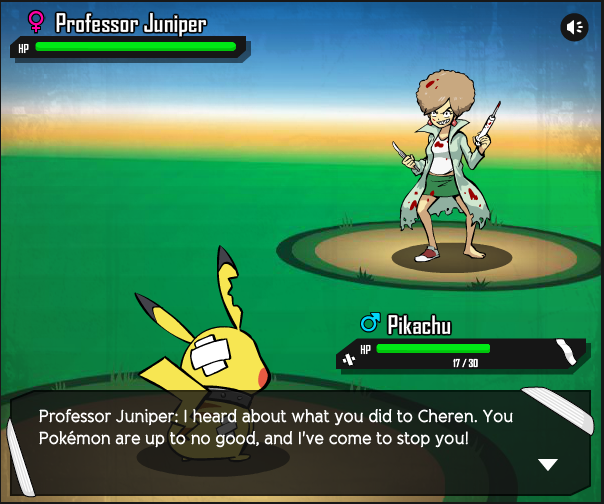 The professors are always in favor of treating Pokemon with kindness and even your Rival learns their lesson in the end. So basically, PETA made a game to try to teach the same message the Pokemon games are actually teaching…. Only they made it ludicrous and over the top. Wait…I forgot. Attempting to review objectively. Uh…uh… The art lends itself well to the persuasive game style they’re going for. They make frequent allusions to the actual games, enough to make it feel properly in-world. But the characters are all being portrayed as completely psychotic killers, such as their portrayal of Ash Ketchum. Pokemon is a fun game for kids about getting along, making friends, playing outside and exploring. Pokemon Black and Blue is a parody of that trying to show that the Pokemon world teaches kids to be violent and uncaring towards animals. I believe they are rather wide of their mark. As with their other persuasive games, they’ve gone so far in trying to prove their argument that it comes off as deluded ramblings. Their game has no bugs, which is nice, and the graphics are well done for their purpose. I award Pokemon Black and Blue 1 out of 5 hearts. I’m really not sure what else to say…I think I might have nightmares. 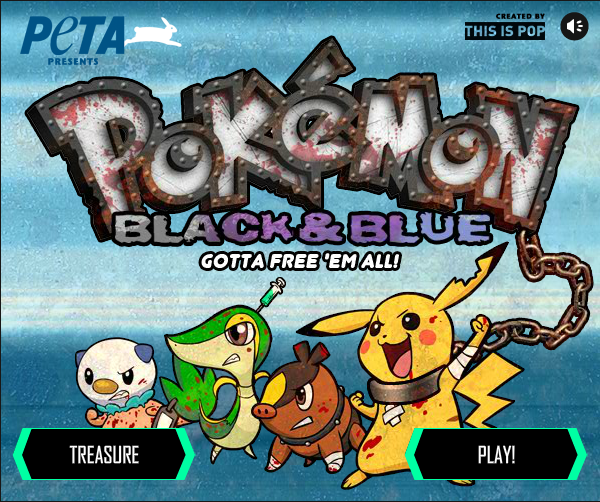 If you’re interested in playing Pokemon Black and Blue, you can find it here, along with links to the other PETA games. Any thoughts about Pokemon Black and Blue? I’d love to hear your comments. Sometimes you encounter a game and can’t help but thinking that it ran away from an arcade in the 80s and that time changed irrevocably because it wasn’t there. Hexagon is one of those games. The controls are very simple, employing only the arrow or WASD keys to control the player. 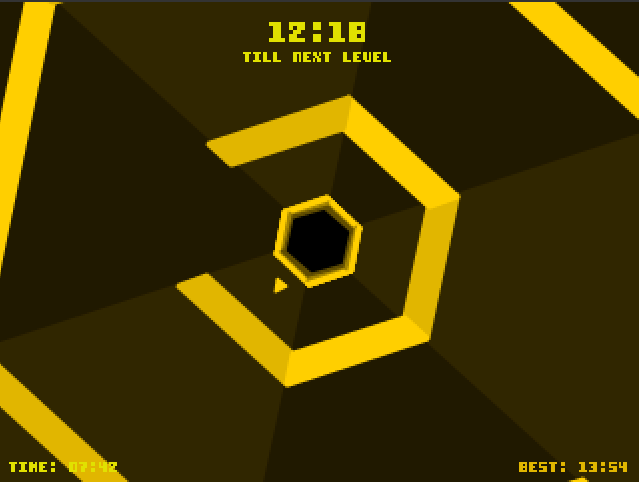 The player is an arrow that can orbit around the center of the screen. The object is to dodge the the lines that are moving in towards the center. The levels go from point to line, all the way up to forming a hexagon. In order to get to line you need to last 10 seconds and the time goes up from there. Remember the good old days of arcade fun where a game was short and you could just keep hitting restart until you had to go do something else? We’re talking on the scale of a minute is winning. I love games that I can use to fill in the gaps in my day, just for a little fun before going back to the day to day. The graphics are simple and visually appealing. Even the sound makes it feel like you’re in an arcade. It remembers your best time and also displays how much longer you need in order to make it to the next level. I really enjoy playing Hexagon. Its simple fun and well made. It loads quickly and you can immediately jump right in and play. That right there is one feature of games that I look for. I highly suggest you check out Hexagon. It is very good, very well made and very fun. I award Hexagon 4.5 out of 5 hearts. 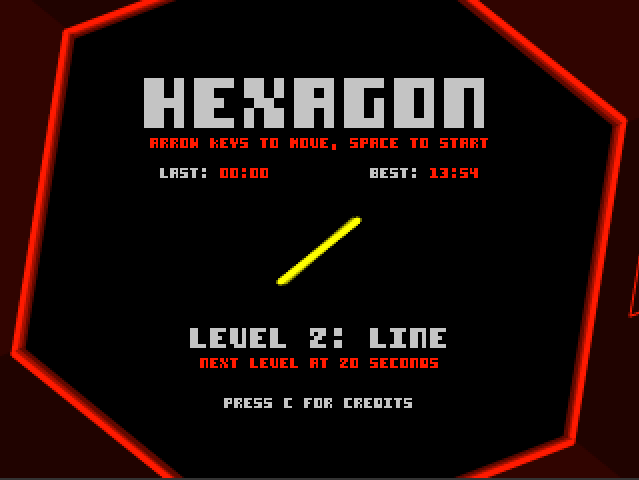 If you’re interested in playing Hexagon, you can find it here on Kongregate. Board games. A social endeavor that many children encounter as some of their first games. They can be used to learn colors and counting and even just social skills. But as with many other kinds of games, there are the good, the bad and the ugly. Today I will discuss 5 of the classics from the “adult” category : Scrabble, Monopoly, Yahtzee, The Game of Life, and Sorry. When I say adult here, I mean not a game meant for preschoolers. Also, this Best of the Best will be a two parter. To find out which is truly the best of these 5, tune in Wednesday of next week. First up, Scrabble. 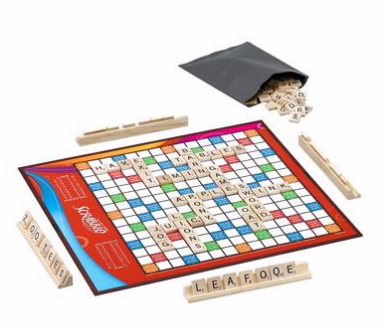 Scrabble is based on the idea of crossword puzzles, where you have words connected to other words in a grid pattern. The major difference is that instead of being given clues about the word, you just have letters and have to come up with the best word out of those letters that you can. So I suppose its more like a Fill-In puzzle without a word bank. Either way, each letter has a point value and certain squares on the board have bonuses to points. Scrabble is a great game for practicing spelling and really rewards people who know obscure words, especially if it has an X or a Z. The one major downside is that this tends to result in the adult players scoring way, way more points than the kids unless the kids have excellent vocabularies. I’m a fan of Scrabble. The rules are simple and it rewards the player for being smart and creative. There’s a strategy to it and while there’s randomness to what letters you have, there is also a lot of skill involved. Scrabble gets a 4.5 out of 5 hearts. Monopoly. How to explain my feelings towards Monopoly. We own something to the tune of six different versions of the game at my house, most of which date from when I was in elementary school or prior. I can’t really remember a game of Monopoly that didn’t end with flipped tables and tears, unless it was being played by my parents and grandparents. Even then, it got competitive to a terrifying level. The story of Monopoly is that you’re a real estate tycoon in the twenties (Read as landlord scumbag) and you’re trying to get a monopoly by putting the other players out of business. If you’re playing by the actual rules of Monopoly, there’s no trading and the items belonging to a player who has declared bankruptcy go up for auction. 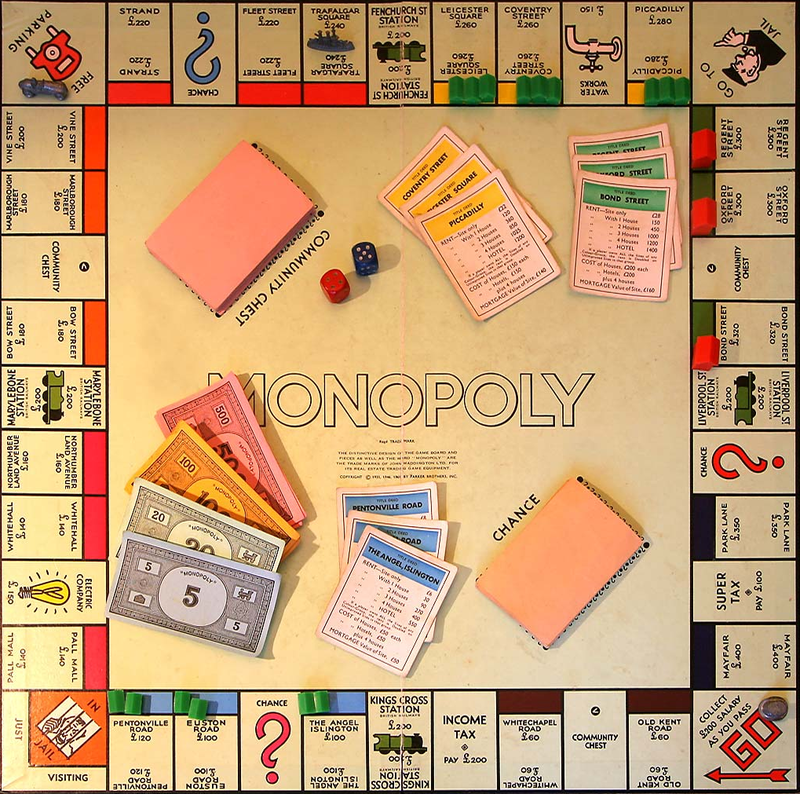 Monopoly is one of the most house-ruled games in existence. You can probably guess that I think rather poorly of Monopoly. If there is one thing that the game really has going for it, it has to be that there is just so much history, so many people learn to play Monopoly as one of the first games they encounter. For that, it ends up getting 2.5 out of 5 hearts. Ah, the puzzle platformer, a truly wonderful genre. 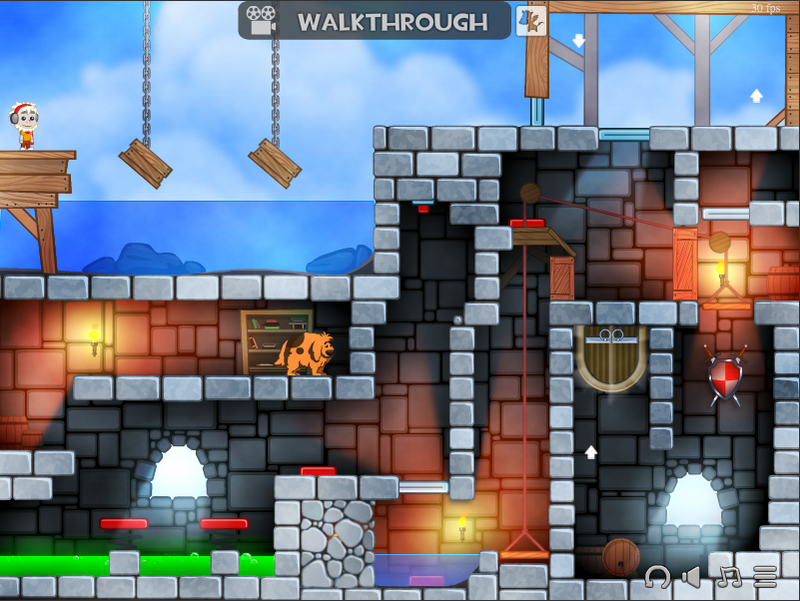 A puzzle platformer is any game where getting to the other side of the level involves more than just jumping on your enemies, usually involving complex puzzles, levers and such. In Pheus and Mor, the player controls a boy named Pheus and his dog, Mor. 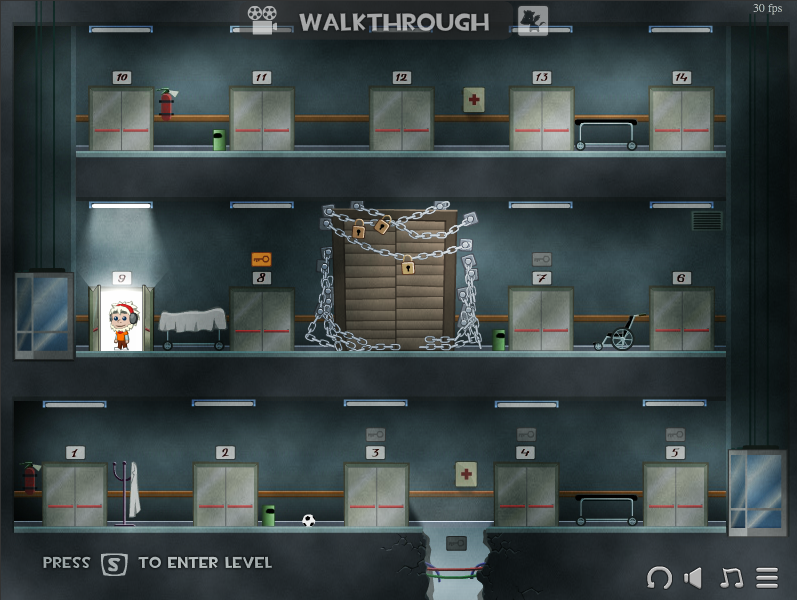 In each level the player has to get both of them to the door. The controls are simple enough, WASD for one character and the arrows for the other. The puzzles, storyline and graphics are what make this game truly awesome. The graphics are really clean and crisp, simple and cute. In the first set of levels, everything is really bright and fun, then things started to get dark. I’m only about half way through, but I’m starting to suspect that the main character might be dead. Its a really crazy feeling. I love the difficulty of the levels, but also that I can go slowly and really think about how its all playing out. Every 4 levels or so, you get another panel in the comic that is the story of the game, letting you slowly fill the pieces in. One of the hardest things about Pheus and Mor is navigating the puzzles while controlling two characters. Each character has their own strengths and weaknesses, for example Pheus is very light and can’t break things and Mor can’t jump. My only complaint so far is that I’ve figured out I need to collect the keys to open the big door in the middle of the room, and I can’t go back to re-try the level where I didn’t get the key but know there is one. Hopefully when I finish the others, I can go back and get it. Over all, this is a very well made game with an excellent way of slowly revealing the plot and a wonderful mechanic. The art style really adds to the entire experience. I’m absolutely hooked and just want to keep playing. I expect to be sad when its done. I award Pheus and Mor 4.5 out of 5 hearts. 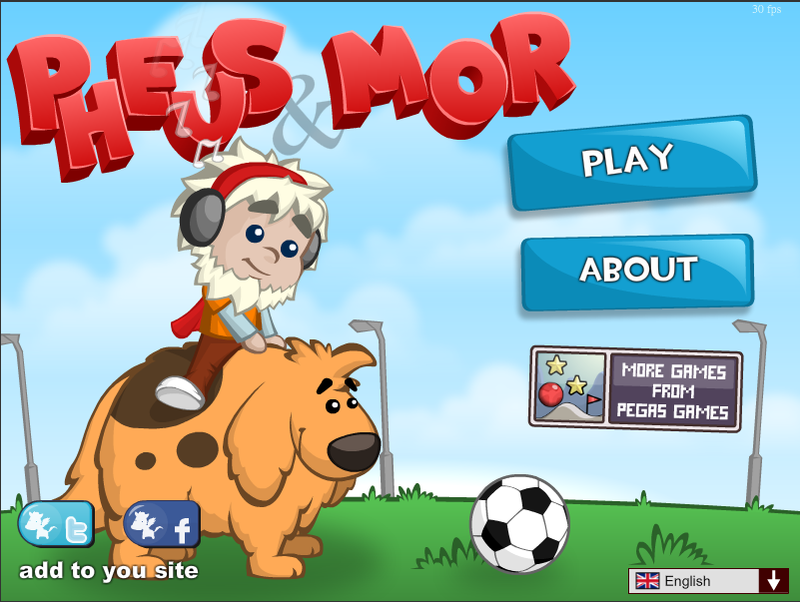 If you’re interested in playing Pheus and Mor, you can find it here on Kongregate.